Interior designers always know how to find just the right combinations to help you say exactly what you want. Some designers like to create mood boards that show various ways to mix and match products; creating the mood you desire and achieving a look you love. 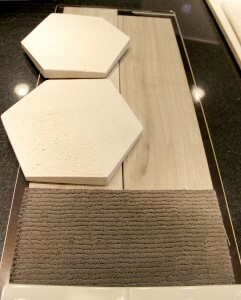 I love the contemporary design of this combination, the way the dark grey carpet contrasts against the other selections and the clean, sleek lines. The hive tiles brings dimension and texture with a mixture of concave and convex pieces and the wood look tile really pulls everything together. With this moodboard I wanted to create a monochromatic design to emphasize the pantone color of the year, simply white. I like how the textures and tone-on-tone patterns create a subtle interest while staying traditional. 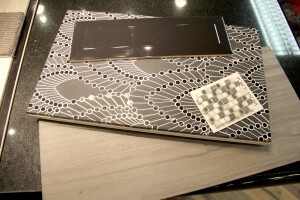 The focus of this eclectic design is the stunning water jet-cut mosaic with an old Hollywood glamour feel. 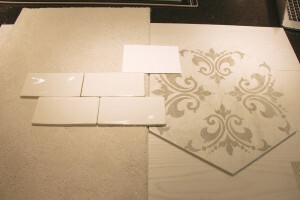 I chose other tile selections that are simple to emphaisze the mosaic as the focal point. The brick mirror mosaic brings a mix of stone and glass. Check out Angela’s profile to learn more about her and her design style!